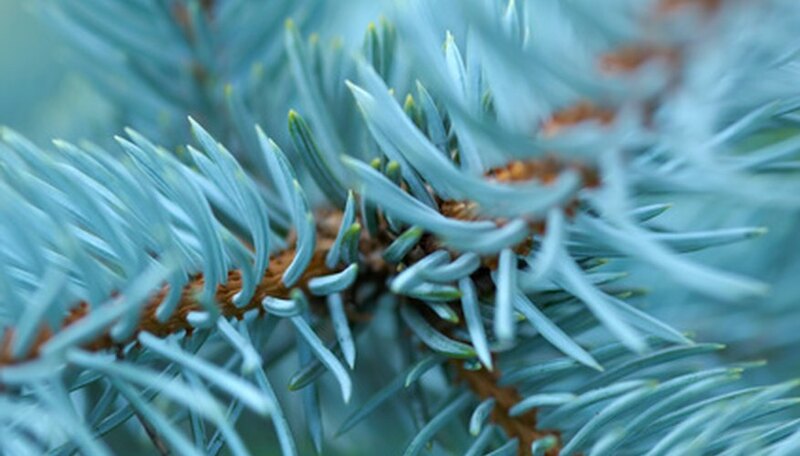 The Colorado blue spruce is one of the most popular evergreens. Landscapers and homeowners use it as an ornamental tree and windbreak. And in the eastern United States and Europe, it is prized as a Christmas tree because of its naturally symmetrical shape, needle retention and attractive blue foliage. The Colorado blue spruce is self-fertilizing and almost exclusively propagated from its abundant supply of seed in the fall. Collect Colorado blue spruce pine cones in the fall before they have had a chance to open. Place the unopened pine cones in a paper bag. Place the paper bag in a warm, dry space for a few days until the pine cones open and the seeds fall into the bag. Shake any clinging seeds from the pine cones and remove them from the bag. Store the bag of seeds in the refrigerator until spring or until you need them. Colorado blue spruce seeds stored in the refrigerator can remain viable for five to 20 years. Soak the seeds two to four weeks before planting them. Place the seeds in a bowl of room-temperature water and leave them to soak overnight. Then pat the seeds dry and place them back into the refrigerator until planting time. Fill your seedling tray with a sterile, commercial soil-less peat-lite mix like Cornell. Place one Colorado blue spruce seed in each section of the planting tray. Then cover each seed with 1/4 inch of the potting mix. Water the seeds so the soil medium is moist, but not overly so. Test the medium for moisture periodically. Water it only when it dries out. Cover the planting tray with a sheet of newspaper to keep them shaded until they sprout in two to three weeks. Keep the seedlings moist and in partial shade for the first year. Then transplant the most viable seedlings to one-gallon pots. Keep them growing there for at least two years (and up to five years) before transplanting them outdoors. Rare forms of Colorado blue spruce are sometimes propagated from 6-inch shoots of new growth manually pulled from the base of the tree. To root the shoot, cut a 3/4-inch V-shaped notch into the base of the cutting. Then dip the end of the cutting 1 inch deep into a powdered rooting hormone so it is covered in roughly 1/16th of an inch of it. Then place the cutting in a 2-inch pot of sterilized moist sand and water. Cover the pot with a clear plastic bag and store it at 80 degrees and keep the sand moist. When the cutting reaches 6 inches tall, plant it outside.